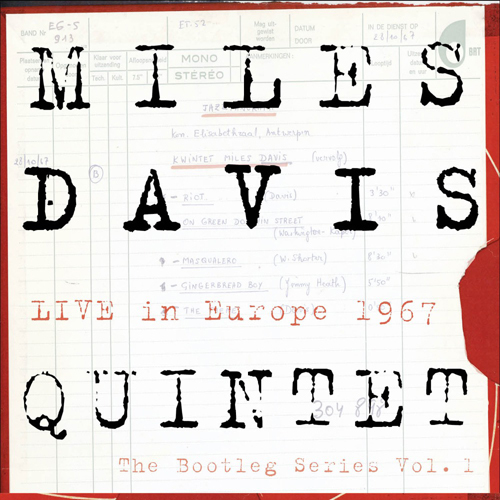 The explosive transformation of Miles Davis’ “second great Quintet” with Wayne Shorter (tenor sax), Herbie Hancock (piano), Ron Carter (bass), and Tony Williams (drums) is laid bare on this release. Culled from original state-owned television and radio sources in Belgium, Denmark, France, Germany, and Sweden, the program spans five northern European festival performances over the course of nine days in October-November 1967. The audio shows consist entirely of previously unreleased or previously only bootlegged material. This is a 3-CD + DVD package, with an 8-panel digipak with 28-page booklet. CD One tracks recorded on October 28, 1967 at the Konigin Elizabethzaal, Antwerp, Belgium by Belgian Radio and Television [BRT]. CD Two tracks 1-5 recorded on November 2, 1967 at the Tivoli Konsertsal, Copenhagen, Denmark by Danish Radio; tracks 6 & 7 recorded and broadcast on November 6, 1967 at the Paris Jazz Festival, Salle Pleyel, Paris, France on France Inter [ORTF]. Radio Program Producer: André Francis. CD Three tracks recorded and broadcast on November 6, 1967 at the Paris Jazz Festival, Salle Pleyel, Paris, France on France Inter [ORTF]. Radio Program Producer: André Francis. DVD tracks 1-6 recorded on November 7, 1967 at the Stadthalle, Karlsruhe, Germany by Südwestfunk TV; tracks 7-11 recorded on October 31, 1967 at the Konserthuset, Stockholm, Sweden by Sveriges Radio TV.